Woodcocks and snipe are a little alien looking to me. They're chubby, with sort of awkwardly sized bills, and their eyes are set back far on their heads (all the better to see a predator with!). To accommodate the placement of the eyes and ears, their brains are flipped inside of their tiny skulls. They feed mainly on earthworms. 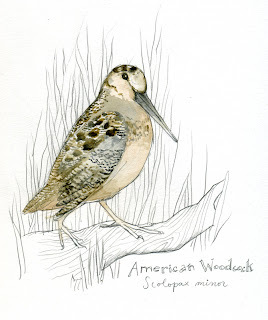 Although considered a shore bird, woodcocks are typically found in damp, brushy, wooded habitat. During the Spring, meaning riiight about now, the males will begin their very elaborate displays. In a nutshell, the male will choose a clearing for his performance and begin by making a series of "peeeents", afterwhich he flutters up into the air, reaches his chosen apex, circles, then divebombs back down while see-sawing back and forth, and then repeats until some female is duly impressed or takes pity. There is a better description in Aldo Leopold's great "A Sand County Almanac". If you have any interest in nature, conservation, and especially if you live in the Midwest, you must read Leopold's prose of the prairie.